The Student Lounge Project is an extension of arki_lab’s previous work with students and teachers at Sortedamskolen. In this process we have worked with 8th graders at the school to brainstorm about their upcoming student lounge. The school faces a major rebuilding and in this context the current staff room will be available and should be turned into a lounge just for students. Students had the chance to act as architects for a day and actually solve a real problem using the knowledge they have acquired in the introductory courses about an architect’s work. The project allows students themselves to come up with ideas and inputs on how their upcoming space should look and what it should contain. 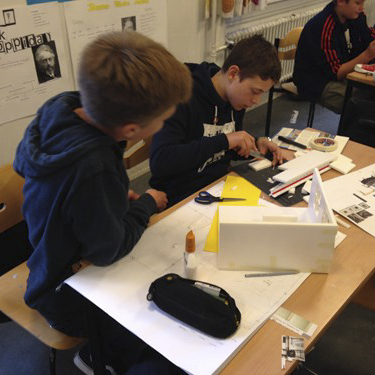 It lets them simultaneously work with many different facets of the architectural profession in combination with the traditional school subjects such as Danish, mathematics and craft and design. For example, students worked with vision collages complete with descriptions of their idea, and using mathematics, they constructed small models of rooms to scale in order to gain an understanding of how mathematics shapes our surrounding natural environment. We experienced that most students want the lounge to feel like a home: it should be cozy and function as a place where you can hang out and feel like you are away from school.